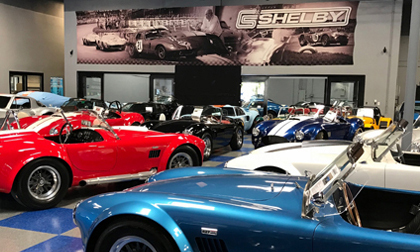 Legendary Shelby Cars continues the heritage of Shelby American’s world famous 1960’s Cobras, Daytona Coupes and GT40’s. The company is keeping the Shelby flame alive with licensed vehicles that include a documented Shelby serial number, just as though production never ended. The current vehicle lineup includes the nimble small block Shelby Cobra roadster in both street and racing (FIA) configurations, the mighty big block Cobra roadster, the world champion Shelby Cobra Daytona Coupe and the Le Man-winning Ford GT40. Each one honors the 1960s era cars with authentic chassis, bodies and powertrain options. Additional information is available at www.shelbylegendarycars.com or www.Superformance.com or by calling (800) 297-6253.